Winder, GA, May, 2017, G2 Research – NEW Civic Duty high-expansion ammunition turns the often underrated .380 ACP into a serious fight stopper. 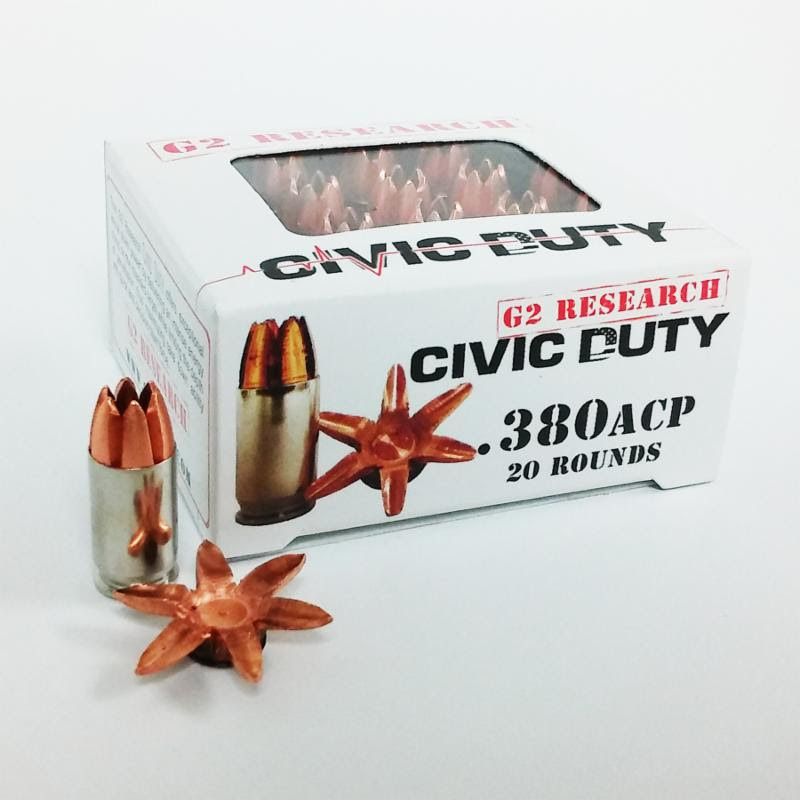 G2 Research’s new high-efficiency .380 ACP Civic Duty self-defense round changes the game. The pure copper, 69-grain, light weight low recoil, specialized CNC-machined bullet moves at 1,250 FPS, then on impact instantly expands into six (6) big flesh-cutting copper petals almost one (1) inch in diameter – transforming the .380 into a truly fast fight stopper. The .380 is seen by many as the red-headed stepchild of the full power 9mm, even though, at self-defense ranges, the .380 performs comparably to the 9mm. Generally, the .380’s lighter bullet and 100-250 fps velocity drop (depending on the loads) has been the major stumbling point for many. Well, not anymore! The sharp, flesh-cutting bullet petals also cause more impact pain and create large temporary and permanent wound channels, all of which adds to its fight-stopping capabilities. #BowtechLIVE Q&A w/ Tim Gillingham + $20k Giveaway!